And the striped collared blouse was just the perfect compliment. i heart those pants on you too nicole!! something about them is just so chic and so vintage YSL! LOVE! The pants are simply amazing! Love how you had fun and matched them with the striped top, vest and necklace. YSL dreams!! The pants are fabulous. You make wish for warmer weather now that winter finally arrived. Wow, those vintage YSL pants are off the hook - and you pull them off so brilliantly. this look reminds me a more elegant, more european annie hall; beautiful! Can I hide myself in one of the pant legs so I can take them home with me when you are not looking???? Ooh I love that top, the mix of prints is so cool!! And your jewelry = awesome!!! You look stunning in those trousers! Oh this is so chic...I love those white palazzo pants and with the lace vest and perfect sunnies, you look the part! Love it! Love all the white! And love that nail polish what color is it? Dying over those pants...They're incredible! You look so amazing! You definitely have the figure to pull off those pants! Absolutely lovely! Really love the addition of the orange!! I am in love with that vest! Those pants are to die for! They scream YSL. Wow. You look like one of those superchic fashion editors they capture outside of the Paris couture shows. Those pants look like a lot of fun! Love that necklace, girlie! You have styled it just perfect....what an eye!!!! those pants are tdf! absolutely gorg! These pictures look like they came out of a magazine. Gorgeous. You look so chic and I'm constantly inspired by your fearless style. Those pants are amazing! love the green nail polish! I love palazzo pants - you look amazing in these! Oh! Those pants are so romantic! Love. What an adorable blog! This post (as with all the others) is so chic! We really love your sense of style! omg, those pants are so fun! Love it with those sunnies too. I love that top! I need to add that to my wish list! 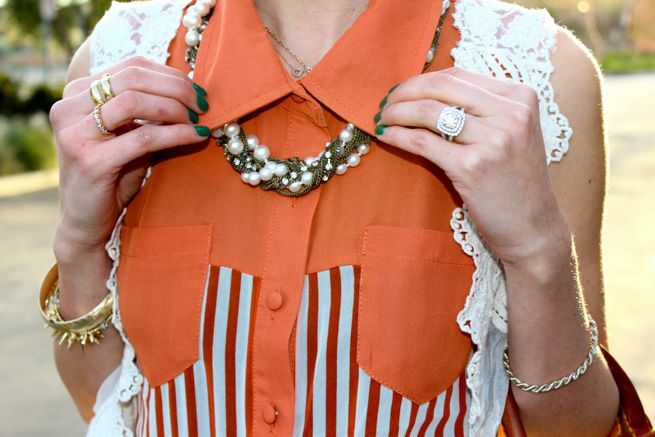 Love your whole outfit and that first image is just so rad vintage 70s--love it! love those pants! edgy look, I like it! Such a chic outfit! I love the mix of prints and textures! Those sunglasses are so great! Such a cute outfit - love the wide leg pants! The pants make you look so tall! I love the element of glamour, and the vest is incredible! Such an amazing ensemble! Wow! The PANTS..The Pants...The Pants. Have I professed my love? I think so. So classy! And your engagement ring = SOO GORGEOUS. I don't know, but I don't think I've ever noticed it before! First of all, those pants??!! DYINGGGG seriously, wow... what an amazing find! ;) You know how I love my vintage! And that top is super fabulous, Nicole! I love the vest too.. this look is one of your best! Love it! Fresh is the word for this fabulous little ensemble. ooooh love the look! the pannts and heels are awesome!! The necklace is brass or gold? It is so beautiful with pearl.The jewelry setwith your dress, it is so amazing.